Southern Kings head coach Deon Davies is staying consistent with his team selection as the team head to Belfast this weekend in the Guinness PRO14. The South African side have enjoyed reasonable performances recently against Munster and Cardiff Blues, in spite of losing. 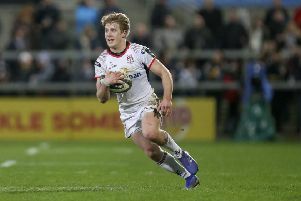 And Davies is hoping to see his side continue to improve when they face Ulster at the Kingspan Stadium on Saturday evening. After a two-week break since their last match – a close 19-26 defeat to The Blues in Wales earlier this month – the side are eager to get back to action and will look to earn their first overseas win of the season. Announcing a 25-man squad which left Port Elizabeth on Wednesday bound for Belfast, Davies said: “We have opted for consistency with the aim of building momentum from what was a close match against Cardiff Blues two weeks ago. “A guy like CJ Velleman, who missed out on the last tour because of a suspension, could have easily come back into the side, but we have somebody like Henry “Bakkies” Brown who performed very well for us on tour, and so did Stephan de Wit, but we could only pick one of them. Experienced scrumhalf, Sarel Pretorius, was omitted from the touring squad after he sustained a knee injury at training last Friday. The 34-year-old Pretorius will be undergoing scans this week to determine the extent of his injury. His place in the touring group has been taken by Ruan van Rensburg. The Kings are expecting a thrilling encounter with one of the top Irish sides in PRO14 Rugby. Ulster have won 10 of their 17 matches so far this season, with only five defeats. FORWARDS: Alulutho Tshakweni, Schalk Ferreira, De-Jay Terblanche, Lupumlo Mguca, Pieter Scholtz; Michael Willemse, Alandre van Rooyen; JC Astle (c), Andries van Schalkwyk, Stephan Greeff; Henry Brown, Martinus Burger, Andisa Ntsila, Ruaan Lerm. BACKS: Stefan Ungerer, Ruan van Rensburg, Rudi van Rooyen; Bader Pretorius, Masixole Banda; Tertius Kruger, Meli Rokoua, Harlon Klaasen; Yaw Penxe, Bjorn Basson; Ulrich Beyers.